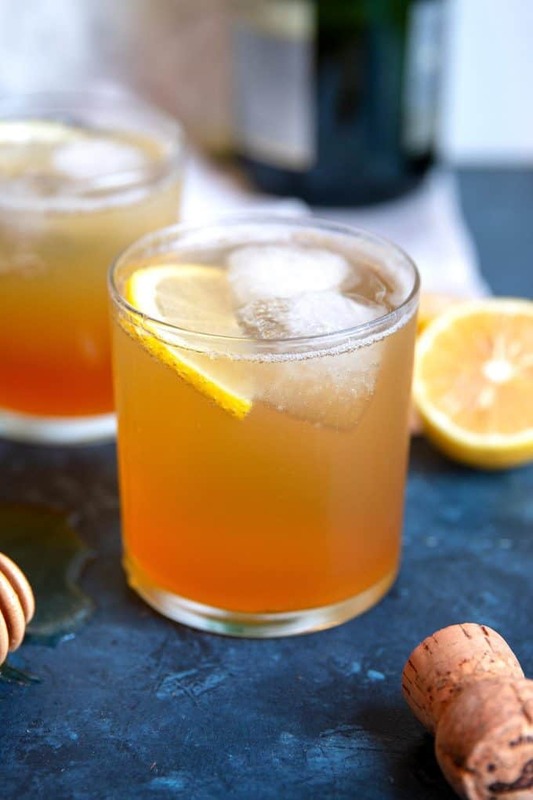 This sparkling honey rye whiskey cocktail is easy to make. Only 4 ingredients – perfect for parties and signature wedding drinks! I am a fan of both sparkling wine AND a fan of whiskey so I decided to combine them. Why not, right? Both are kept on hand in my home at all times and sometimes I just need a change. 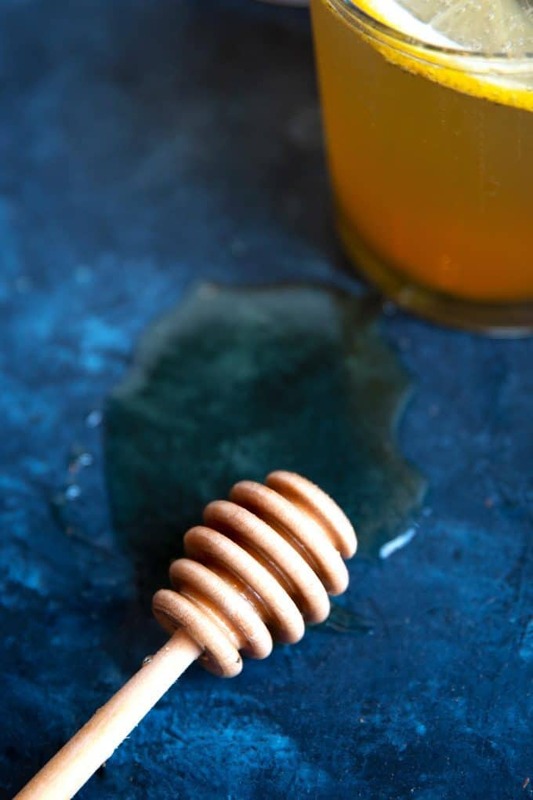 Classic cocktail ingredients like honey and lemon are also always available so it’s time to get a cracking (or a popping’!) and get this whiskey cocktail party started. To start, grab your favorite cocktail shaker. I have several but always end up using the same one. Does anyone else do that? Anyway, add some ice to the shaker and add the rye whiskey, honey, and lemon juice. Shake it up really well and then strain it into a glass filled with ice. I suggest using a large ice cube so it doesn’t melt quickly. 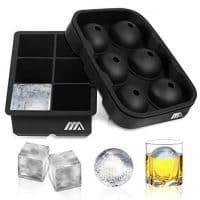 This large, square mold silicone ice cube tray is perfect. 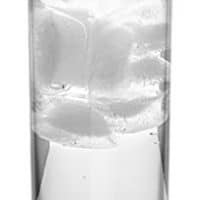 The ice cubes melt much slower and your drink won’t get watered down. Then, top the glass off with your favorite sparkling wine. Champagne, prosecco, cava – they all work! What kind of whiskey should I use? 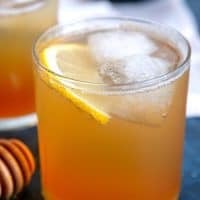 For this cocktail, I am using rye whiskey. It’s spicier and more dry than bourbon. You could substitute bourbon for the rye if that’s what you have on hand. Some of my favorite brands of rye include Woodford Reserve and Bulleit. Have a brand you want me to try? Let me know in the comments. 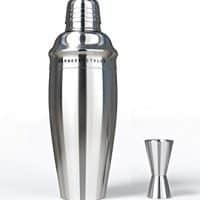 What type of glass should this cocktail be served in? 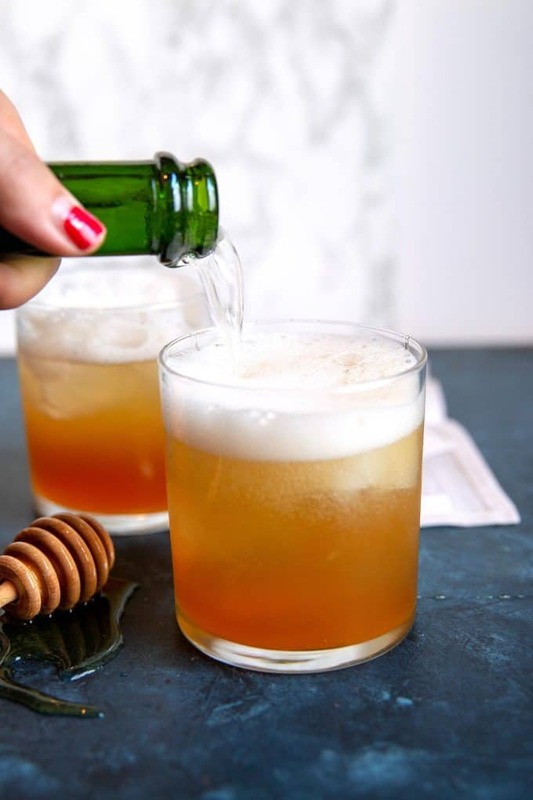 How should I garnish this sparkling honey rye whiskey cocktail? Lemon rinds, lemon wedges, lemon anything (except for the whole lemon!) A lemon wedge is a great option in case the drink is too sweet for some people – squeeze a little more lemon juice in the glass and you’re set! 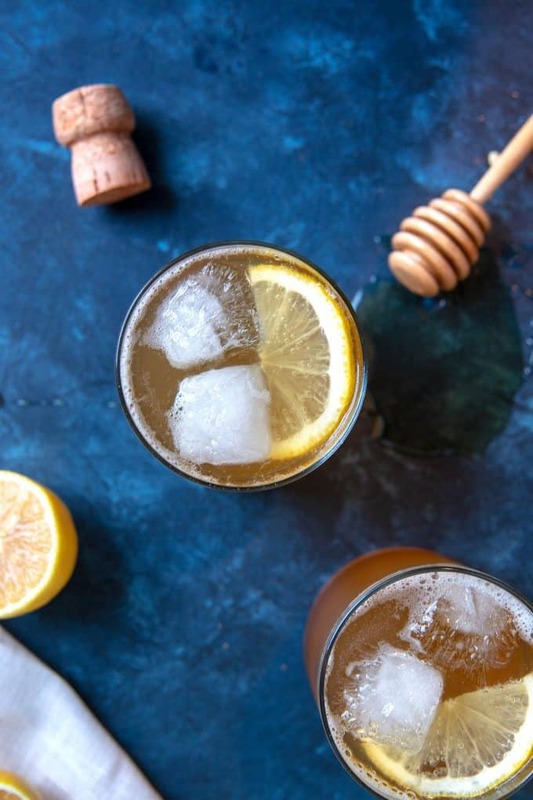 Try these other sparkling cocktails! 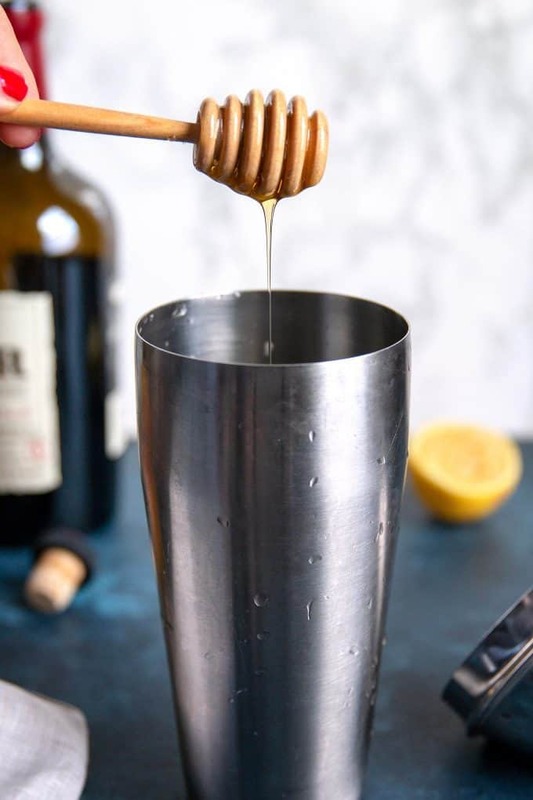 Add ice cubes to a cocktail shaker. 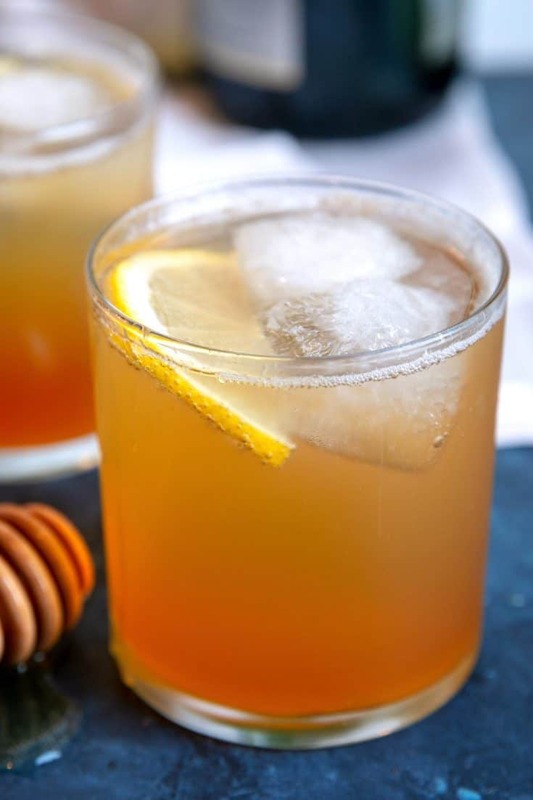 Pour the whiskey, honey, and lemon juice over the ice. Then shake vigorously. Strain the rye into a glass filled with ice. Top the glass with sparkling wine. I picked up a bottle of this very Rye for my husband recently and it’s been so long since we’ve had a whiskey cocktail…love the sparkle component! Cheers!